Our dog, Blue, is a reactive dog. For those of you who already know what that means, I sympathize. For those that don't, it means your dog has a fear of something and reacts to it (usually) in what people perceive as an aggressive manner. Blue loves people but he reacts to other dogs getting in his space. 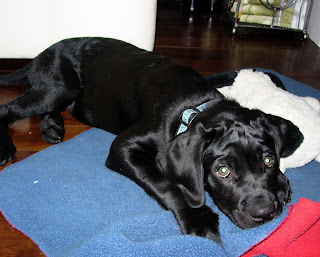 Blue is a mastiff-lab cross, a rather large dog, so being reactive is not a Good Thing. Blue had a hard childhood. Dumped in a park by his mother's owner just as he was born, he grew up without his momma to teach him confidence. Even as a baby, eyes not yet open, he already had food sensitivities and would cry in pain if his formula changed. I socialized him like crazy, knowing that growing up without a mother was potentially going to have detrimental effects on him. I'd had a reactive adult dog before and was determined that because I got Blue as a puppy, I was not going to let that happen. I did everything I was supposed to. Puppy classes, consistent, positive, Ian Dunbar and Stanley Coren training, lots of people and dog play at the park, exposure to many different situations. Unfortunately, at 5 months of age, play with other dogs became painful. Xrays showed that he had elbow and hip dysplasia. The next 4 months of his life were filled with multiple surgeries and recoveries to try to repair his painful joints. During this time he missed a vital socialization period. Despite missing this time to get to know other dogs, after he had healed from all the surgery all seemed to be well until he reached the age of social maturity, at about 18 months of age. At social maturity brain chemistry changes. It was as if something had flipped in his brain and he started charging other dogs. He had learned as a puppy that other dogs caused pain when they tried to play with him. He now headed off their attempts to play with barking and growling. As this worked so well to make the other dog go away, the reactive behaviour quickly became ingrained and he would react faster and with each subsequent time. In his head, it made perfect sense. Although he had never bitten another dog, I was worried that it might happen. It wasn't looking good for Blue. I saw him consigned to a life where he couldn't get enough exercise because he couldn't be off leash at the park or beach when other dogs were there, not being able to enjoy him as I was constantly on the watch for a situation where he might get into an encounter with another dog, him wearing a muzzle most of his life so no fetching sticks or balls, or even euthanasia. Blue had taken puppy classes at DogSmart and I knew that they helped with behaviour problems. We met with Alice, DogSmart's director and CPDT-KA certified trainer who specializes in problem dog behaviour. Although in our initial consult it took Blue a full hour to settle down to chew a bone, Alice saw hope for Blue. 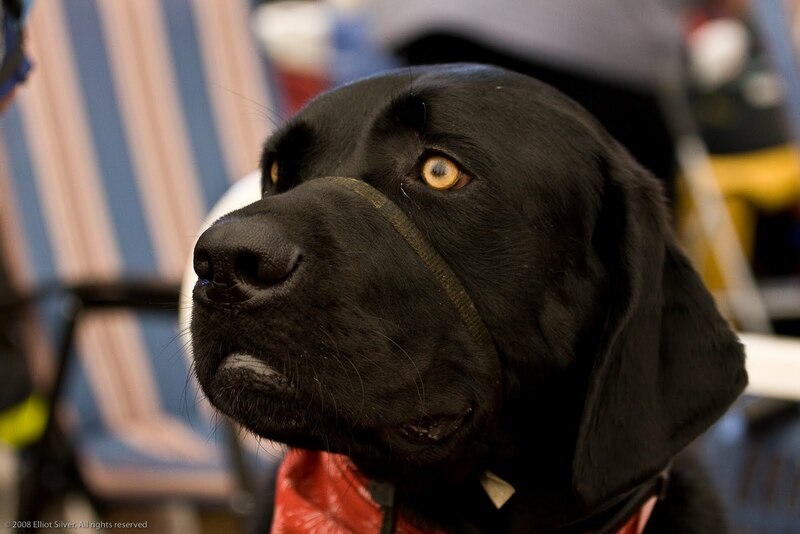 She recommended we also consult with a veterinary behaviourist, as well as enrolling him in reactivate dog classes. She fitted him with a basket muzzle and Gentle Leader collar so he could pant and laugh but be safe around other dogs, suggested getting a D.A.P. collar and diffuser, and set about retraining me with some tough love. Alice thought he would be a candidate for medication to lower his stimulation level and the veterinary behaviourist agreed. Over the next 8 months, with lots of hard work, Blue became a much better dog. The medication allowed him to be able to pay attention and he learned to look to me for cues as to what he should do, rather than making (bad) decisions on his own. The muzzle meant that I could relax around other dogs, allowing calm and positive retraining of behaviours. The D.A.P. calmed him one step further. We took lots of classes with Alice and Blue learned he had a different choice than acting defensively. More and more he chose to turn away and avoid encounters. One of the many classes I took him to was a tricks and games class. In the final class, the instructor put out a tunnel and some jumps to play with. 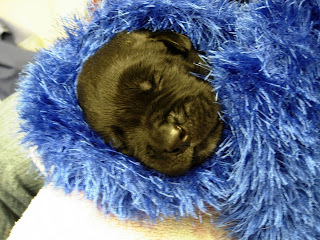 Just once through the tunnel and it was like Blue suddenly realized what he was born to do, and that was agility. I'd never seen him so excited and happy. 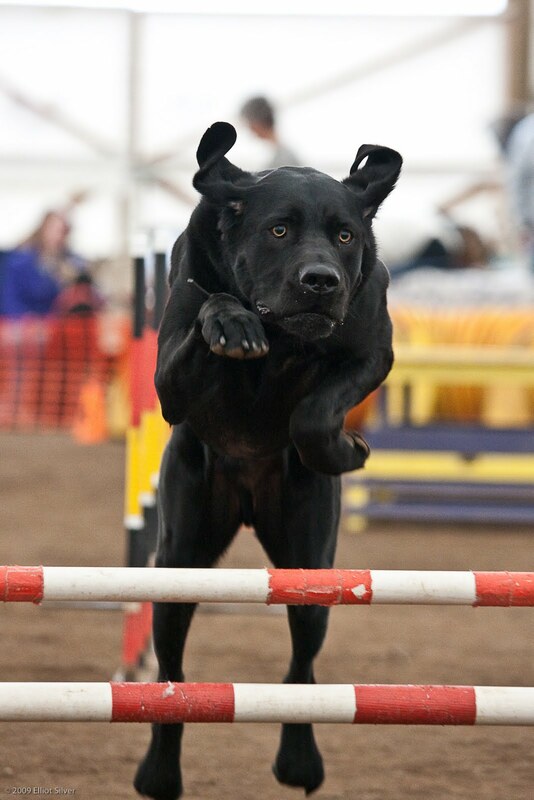 We enrolled him in agility classes with instructor Nicole and he has never looked back. Blue's reactivity has decreased dramatically. I gradually was able to wean him off the D.A.P. collar and basket muzzle as he became more and more focussed. He avoid dogs if at all possible and he never initiates an encounter. If another dog ignores his body language that says that he wants to be left alone and insists on being in his space, he will bark defensively and try to get away. Dogs being dogs, he has been attacked by a few dogs. In the few tussles that have inevitably resulted, he has never bitten another dog. He has gotten better and better at agility the longer he works. He amazes me with how smart he is. He tolerates other dogs amazingly well. Just over 3 years later, this reactive and unlikely agility dog is a Masters Agility Champion. The only thing that will stop him in the future will be arthritis in his joints, as in spirit, he would love to do agility forever. He loves to go to class and trials. I love that he wins me many colourful ribbons. And we just love him. Thank you, Alice for saving his life, and thank you, Nicole, for shaping a champion. What a story - a cute heroic dog, with dedicated loving owners. Blue is an awesome dog. Simply great. Teresa has done such wonderful work with him. I didn't know him during his very troubled youth, and I often just can't believe the stories that Teresa tells about him during that time. "Blue couldn't have done THAT!" I hear myself saying time and time again. But apparently he was a very troubled beast and not great fun to have around. Now he's my super buddy! Blue's grandmother is so proud of him and his Mum. What enduance! This is very beautiful; thank you so much for sharing! WWGD - What Would Grok Do?